Accurately counting maize tassels is important for monitoring the growth status of maize plants. This tedious task, however, is still mainly done by manual efforts. In the context of modern plant phenotyping, automating this task is required to meet the need of large-scale analysis of genotype and phenotype. In recent years, computer vision technologies have experienced a significant breakthrough due to the emergence of large-scale datasets and increased computational resources. Naturally image-based approaches have also received much attention in plant-related studies. Yet a fact is that most image-based systems for plant phenotyping are deployed under controlled laboratory environment. 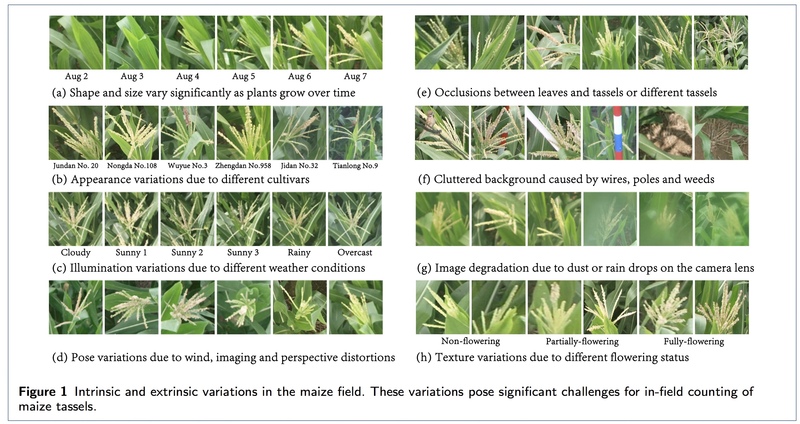 When transferring the application scenario to unconstrained in-field conditions, intrinsic and extrinsic variations in the wild pose great challenges for accurate counting of maize tassels, which goes beyond the ability of conventional image processing techniques. This calls for further robust computer vision approaches to address in-field variations. This paper studies the in-field counting problem of maize tassels. To our knowledge, this is the first time that a plant-related counting problem is considered using computer vision technologies under unconstrained field-based environment. This results is published in the Plant Methods journal. This entry was posted in deep learning, publications, research. Bookmark the permalink.